The Fermata Charging Stand from Twelve South is designed to display and charge your wireless headphones. This aluminum stand features a contoured leather saddle that provides a premium, cushioned feel. In terms of charging, the Fermata comes with an additional in-base USB port, an integrated 2m charging cable, and outputs up to 2A of power. Moreover, it's compatible with international plugs and includes adapters for continental Europe, Australia, New Zealand, UK, Hong Kong, Singapore, and China. 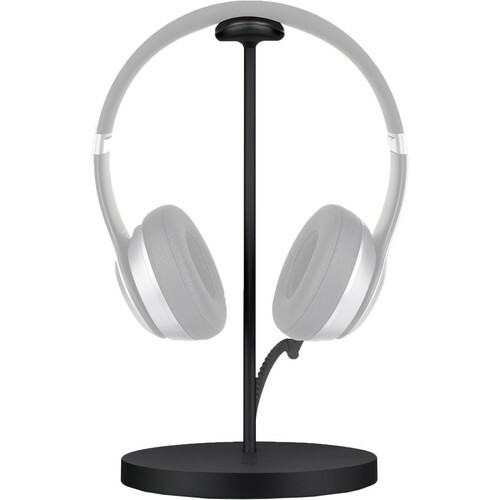 For extra organization, this stand comes with an earbud hook. Give Your Headphones the Rockstar Treatment. Hang your wireless headphones with the Fermata support saddle that's contoured with a leather pad. The post is set back to ensure your leather headphone pads don't rub against any support structure. The Fermata has a dedicated, wall-powered charging station that's designed to keep your wireless headphones fully charged. This stand comes with an AC plug and 2m power cable. It also has an extra USB port to charge an extra device. To keep everything tidy, wrap the excess cable beneath Fermata's base.